You are here: Home › Disney › General Announcement › Live Appearance › Merchandise › Originals › Pop Gallery › Prints › Strangeling Emporium › WonderGround Gallery › Works-In-Progress › Update – New Original Paintings, Disney News, T-Shirts, Loup-Garou & more! 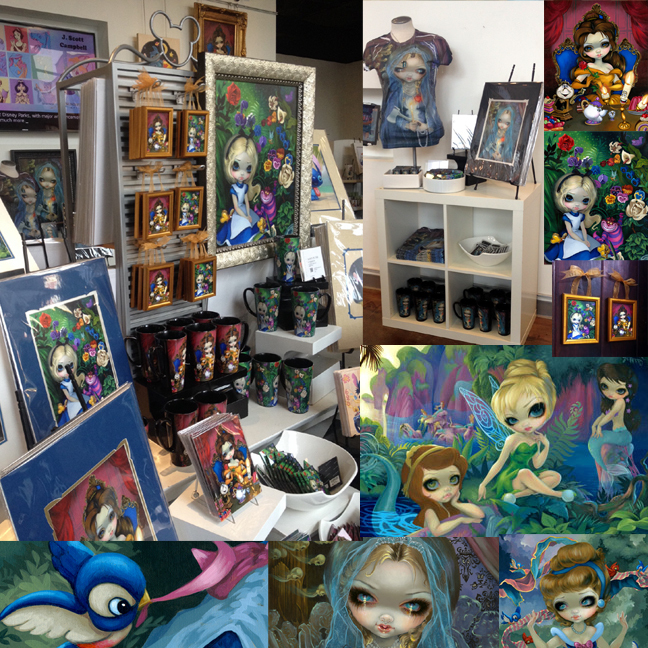 Update – New Original Paintings, Disney News, T-Shirts, Loup-Garou & more! It has been a busy couple of weeks, and I have a lot of new things to show you & tell you about! ***Reminder – my Pop Gallery Princess show is THIS SATURDAY. Details here. This update has some exciting Disney news (a “Tangled” preview, and some great eBay Disney collection news), three new original paintings, info about my upcoming Strangeling T-Shirt line, details about Saturday night’s event at Downtown Disney, and also an auction for a new “Tiny Treasures” miniature painting for sale. Definitely scroll down to see all the new stuff! A beautiful installment in my very popular “Loup-Garou” series (French for “werewolf”) she was also my contribution to the 78 Tarot project (a neat project with 78 different artists illustrating a tarot deck). My assigned card was The High Priestess. Rather than the more typical iconography of the black column and the white column, I’ve gone a wolfish route and am gave the priestess a Black Wolf and a White Wolf. 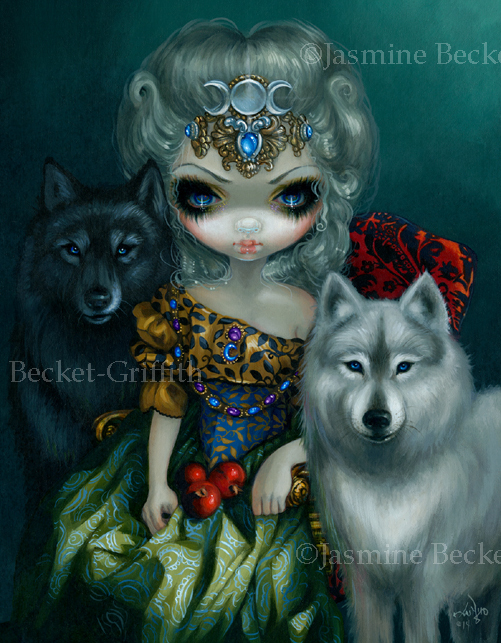 My Loup-Garou series is a series of paintings featuring baroque/rococo style portraiture along with majestic wolves, and this one is titled “La Grande Prêtresse” (the High Priestess). Glossy Paper Prints are signed by me on the back, come in two sizes, and are on sale this week. You can buy them at strangeling.com or up in our StrangelingEmporium eBay store HERE for the 8x10s and HERE for the 12x16s. Glossy Paper Prints are signed by me on the back, are also 6″x6″, and are on sale this week for only $9.99. You can buy them at strangeling.com HERE or up in our StrangelingEmporium eBay store HERE . 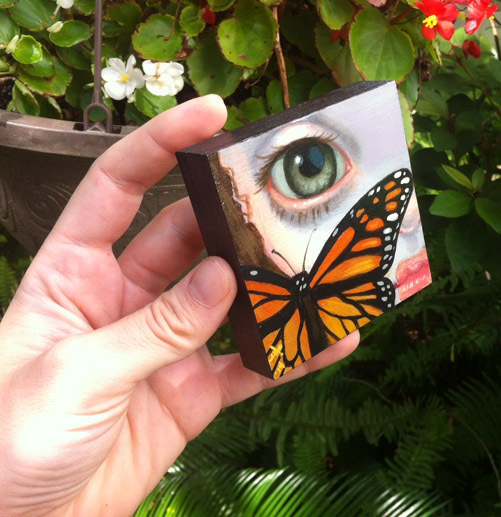 ORIGINAL Acrylic Painting on a 3″x3″ cradled wood panel – ready-to-hang! After several months of trying different methods, rigorous washing machine endurance tests, and my whole family pitching in, we’re pleased to announce that Strangeling T-Shirts are in the works! I have long wanted a high quality t-shirt option for my work, and we have decided to produce them ourselves, at home, using a special dye-sublimation technique. This is the method that works best and provides us with the best quality – the images hold up to our tough “washing machine test” (ie, putting them in the washer & dryer over & over again) without fading, cracking, etc. like some other methods, and we are very happy with it. Very soon we will be implementing an option to place orders for tshirts in ALL SIZES (yes, plus sizes, kids’ sizes, extended sizes, juniors’ sizes, etc. ), with options to choose all sorts of coloured shirts (black shirts, white shirts, tie-dyed and patterned shirts, – our sublimation transfer process works perfectly on all of them). Prepare for an announcement soon when this is launched – it will mean that you can choose your own size, colour, etc. for whichever painting design you like! In the meantime though, while we wait for incoming shirt stock and website-admin shenanigans, we are listing a handful of these new shirts (our first finished batch of prototypes) in our Etsy store. They are already selling fast, and I apologize in advance if we are already nearly sold out. This initial batch is just our test-market of various sizes, shapes, colours & images – again, in the future at Strangeling.com we will be implementing a launch site where you can choose your own sizes, etc. In the meantime check out what we have up on Etsy HERE – click on the “CLOTHING” link at the top left hand corner of the screen to find whatever shirts we have available! (And check out all the other neat jewelry, prints & stuff too of course). Another Disney piece – Rapunzel from Tangled! 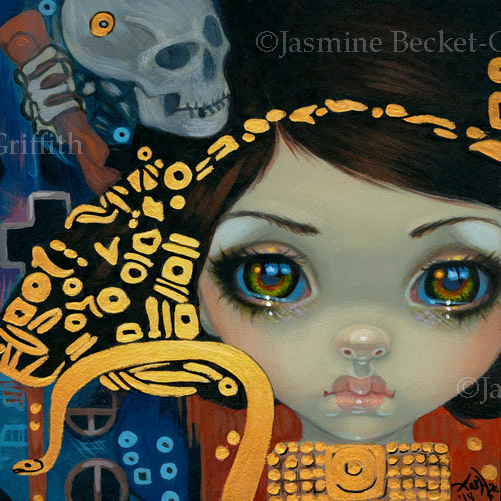 Sneak-peek – a few hours away from finishing still – this is a piece for Disneyland’s WonderGround Gallery in California – I will be debuting her on July 12 & 13th – I’ll be there BOTH days this time (details about the event are HERE). I’ve had the joy of sorting through a lot of the original concept art from Disney’s “Tangled” going back several years, and as some of you Disney-scholars out there may know, part of the film’s aesthetic was based on Fragonard’s “The Swing” (obviously one of my favourites too). 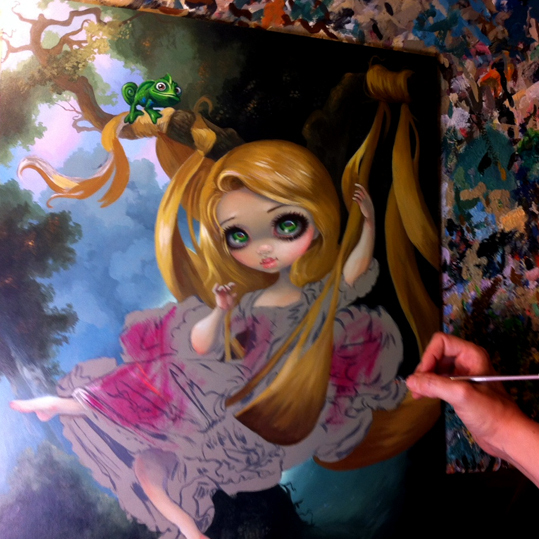 This scene features the iconic image of Disney’s Rapunzel in a swing of her own hair, and of course the little chameleon Pascal is up in the branches 16×20 acrylic painting on panel, the original painting, prints & merchandise will be available at WonderGround Gallery. These will be WonderGround Exclusives for purchase only from the gallery at Disneyland (and YES they are happy to ship WORLDWIDE via email or phone orders). Also the entire month of July WonderGround will be having a special “Artisan Showcase” fetauring a month long display of my non-Disney personal art as well (I’ll just be there in person on July 12-13 though, so try to stop by if you are in California that weekend!). ©Disney – licensed and used under contract. Basically, my Disney art is only sold by Disney (whether it be at Disneyland, Disney World, the various Disney galleries, or Disney branded Hamilton Collection products, etc.). As licensed/contracted work, I can’t make & sell them myself. A lot of my Disney artwork & merchandise is exclusive to WonderGround Gallery out in California, and I myself am way down here in Florida, so I can’t really go grab stuff to re-sell myself either for fans. But – a lot of people who DO live in California very helpfully regularly stop at the gallery at Disneyland to buy stuff to re-sell on eBay (yes, at a little increase in price, but hey – that’s what makes their travel time/costs worthwhile!). Every day we scour eBay and gather together these auction listings to helpfully put them all in on eBay Collection page ( HERE) – so you can find all of this stuff in one spot. These are all different sellers, they are not being sold by me, they all have different payment & shipping options, etc. 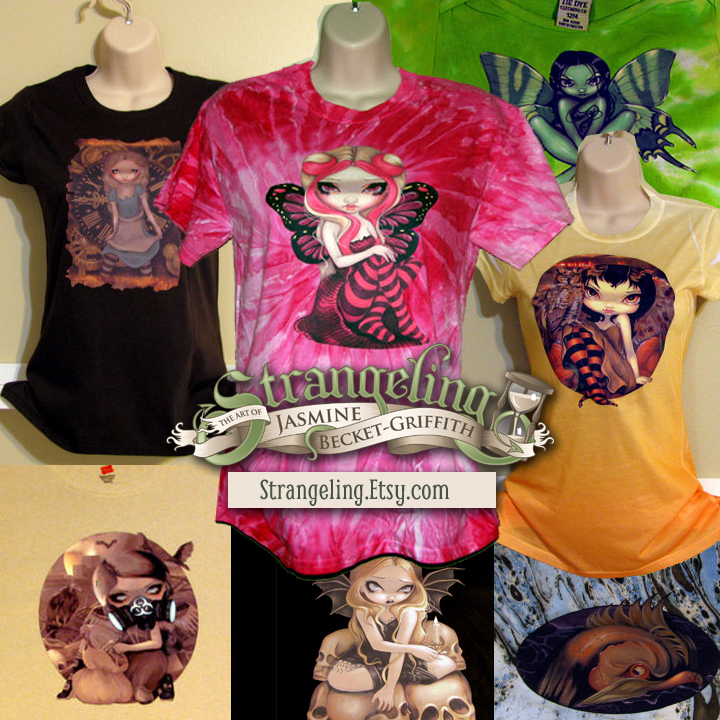 – but they are all authentic Jasmine Becket-Griffith / Disney products. If you bookmark or “Follow” the collection pagehere, you can see the new stuff as it comes out, updated with new auctions daily. For those of you who do not use eBay, always remember that WonderGround Gallery is happy to ship worldwide, and they now take orders via email – [email protected] – and telephone (714) 781-4565. I will be at Pop Gallery Orlando at Downtown Disney West Side here at the Walt Disney World Resort on THIS Saturday, May 3rd for my “Princess Portraits” show! The event is held from 7pm-10pm, it is a free event, we will have prints, canvases and original paintings available (glossy paper prints from $20, canvases from $95, also free postcards! ), loads of other artwork & merchandise, and the highlights of the show – the debut of my two latest Disney paintings – “Part of Your World” (featuring Ariel) and “Belle’s Royal Portrait” (featuring Princess Belle from “Beauty and the Beast”). I will be happy to sign anything you purchase at the event OR anything you’d like to bring with you from home! All ages are welcome!